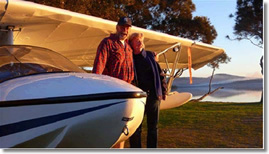 In June to August this year Pete Stuart-Smith and his wife Trish will be circumnavigating Australia in their homebuilt SeaRey amphibian aircraft VH-PAZ. The trip, In the Steps of the Black Cat, will retrace the final flight of Flight Lieutenant Ian Stuart Smith (Pete’s father), a WWII Catalina captain, in a PBY-5 Catalina flying boat in 1945, and take in all of the Australian operational bases of the “Black Cats”. The start of this journey will be marked by a special event at Rathmines on Saturday 7 June 2008 (the Queen’s Birthday Long weekend) to which you are all invited! The program for this event (which appears below) will include a “bon voyage splash in” of an assortment of seaplanes and amphibians (such as the SeaRay) as well as the conclusion of the auction of the limited edition print of David Marshall’s painting of P G Taylor’s Catalina Frigate Bird II taxiing in the open ocean around Easter Island (details appear towards the end of this article). Pete and Trish’s expedition, sponsored by the Australian Geographic Society, and supported by the Catalina Association (NSW), Lake Macquarie Historical Society and the Seaplane Pilots Association of Australia, will raise awareness and support for the “Catalina Flying Memorial” based in Rathmines. raise money and foster awareness and support for the newly acquired Catalina aircraft (VH-CAT) that forms the heart of the Catalina Flying Memorial to be based at Rathmines. 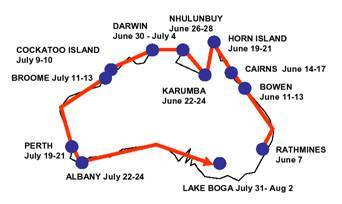 Commencing at Rathmines on 7 June and terminating at Lake Boga on 2 August, the eight week trip will take in all of the Australian WWII operational bases and Catalina sites of significance. Our patron Nancy Bird Walton has kindly donated this limited edition print of a painting by David Marshall of P G Taylor’s Catalina Frigate Bird II taxiing in the open ocean around Easter Island. This print was gifted to Nancy by David Marshall because of their joint interests in this remarkable man, this remarkable aircraft and this remarkable feat. To obtain funds to ferry and operate our own Frigate Bird II, we are offering to sell by “Dutch” auction this priceless print. 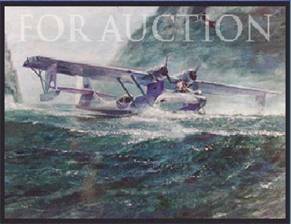 Bidding started a few months ago, with many bids being placed on-line via The Catalina Flying Memorial Ltd’s website. The auction will finally conclude at Rathmines during In the Steps of the Black Cat event on 7 June (see program below for details).